No video ? Anyway, I get the idea from the screenshot. 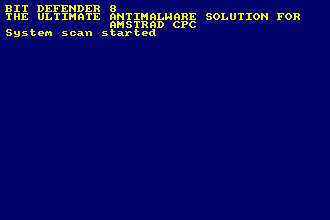 It is a fake version of bit-defender for the CPC :) What a funny idea! Moreover bit-defender originates from eastern-europe which makes it possibly quite popular in Slovakia. No video, if you're too lazy to run an emulator, I don't feel motivated to do a video for you. I don't want the screenshot to reveal too much about the prod, with such simple ones the timing is quite important for the "dramatic" effect. PulkoMandy, would you please recommend decent linux amstrad emulator for this demo? page created in 0.014299 seconds with 15 queries.